Artist Jan Tichy plans to memorialize Cabrini-Green as it falls. Opens Mon 3/28, 7 PM. Through end of demolition: Mon-Sun, 7 PM-1 AM, Division and Scott streets between Halsted and Larrabee, projectcabrinigreen.org. We had to start over! The Chicago Housing Authority plans to start tearing down the vacant building at 1230 N. Burling next Wednesday. If that happens—the demolition has already been postponed once—March 30 will be a historic day. The 134-unit apartment complex scheduled to go under the wrecking ball is the last of the Cabrini-Green public housing high-rises. Cabrini-Green is the stuff of legend and infamy, and discussion about what it meant is sure to go on and on. The place has come to epitomize the folly of urban renewal—and maybe of modernism itself, which, some argue, has been dying a slow death since Saint Louis's Pruitt-Igoe projects came down in 1972. 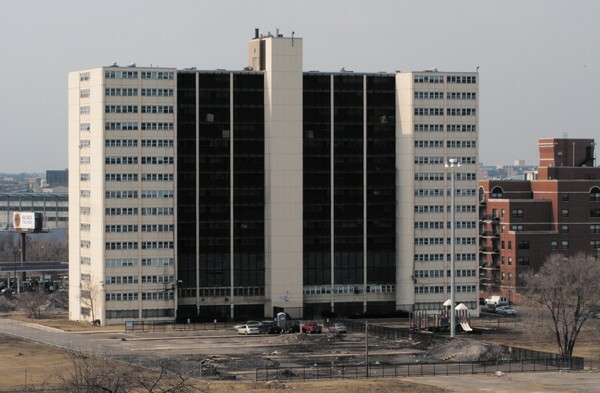 Cabrini-Green was the scene of the 1992 thriller Candyman, the 70s sitcom Good Times, and the political theater of Mayor Jane Byrne's three-week residency in 1981. People everywhere associate it with crime, drugs, gangs, squalor, broken elevators, and violent death. But for tens of thousands over the decades since the first Cabrini residences were built in 1942, it was home. To commemorate the end of Cabrini-Green and call attention to its role as a haven, a group including Prague-born School of the Art Institute faculty member Jan Tichy, social worker Efrat Appel, and 25 SAIC student collaborators is preparing Project Cabrini Green—an art installation that combines LED and sound technology with short stories and poetry on the themes of home, housing, and community. The writings were supplied by 110 Chicago teenagers, some of whom lived in Cabrini and even at 1230 N. Burling. Ranging in age from 12 to 18, the kids penned their efforts in workshops run through the Marwen Foundation, the city's After School Matters program, a mentoring organization called Cabrini Connections, and the Cabrini-Green marching band. They then made audio recordings of their contributions, using specially designed software that allowed their speech patterns to determine the rate at which a battery-powered LED light module would blink. "Thus," as the project website puts it, sound was "translated into light." On the morning of March 28, Tichy and his team plan to place a module in each of the apartments at 1230 N. Burling. That evening, the LEDs will come to life, silently flickering to the rhythm of the kids' stories and poems. The spectacle will run from 7 PM to 1 AM that night and every night thereafter, until the Heneghan Wrecking Company completes demolition—about four to six weeks. Tichy expects the white light generated by the LEDs to reflect the colors of the walls around them, giving observers outside a prismatic display. A confluence of art, artists, educators, kids, galleries, community groups, and the CHA, the project is a visual tribute to a place where generations of families lived together in a community. According to Tichy, it's also a "chance for us to listen to what kids have to say. A way to say, 'Let's stop and think about home.'" The workshops were an important part of the project, says Tichy. "A lot of the kids had no idea about the history of the community art movement." To address that gap, they learned about two Chicago murals: The Wall of Respect—created on the south side in 1967, to combat the absence of positive images of African-American men in public spaces—and William Walker's All of Mankind (1972), a remnant of which still graces the facade of Strangers Home Missionary Baptist Church, at 617 W. Evergreen in the Cabrini-Green neighborhood. "It was obvious after meeting with Jan and Efrat that their hearts were in the right place for this project." says Bobby Biedrzycki, an instructor for After School Matters. Biedrzycki teaches 30 of the project participants. "Once we found out it was on the up-and-up, and I made sure this was not a case of the kids getting exploited because of their backgrounds, I brought it to the kids, and they were excited to be a part of it." Workshoppers were given the chance to play with the sound software and see how the cadence in their voices affected the pulse of the light. All she knew about Cabrini-Green before this project, says Alonnie White, a 17-year-old After School Matters "advanced apprentice artist" from Rogers Park, was "somebody getting shot, or somebody died there, or some violence was happening there. So when I heard about the buildings being demolished I did a bit of research and met with people from Project Cabrini Green. It completely opened my eyes to something totally different, and how a lot of people have suffered because they've been dispersed. They're using us to get their word out there, so I'll do the best I can. I have to do exceedingly well." "I have a lot of friends that are from Cabrini," adds Nina Moore, also 17 and an ASM advanced apprentice artist, from North Lawndale. "There had been a lot of Facebook statuses about it like, 'They're tearing down our building,' or 'They're destroying our home,' and when I heard about the type of activity they were trying to get us involved in, I thought this could be something really good, because I was making poems and short stories, and I was already participating in spoken-word activities. So I talked to some of my friends and got their opinion about how they feel about Cabrini-Green. I didn't want to go at it from an outsider's point of view. We know all about the violence and the things the media talked about. But I wanted to get it from the peoples' opinions and what they thought about the destruction of the buildings and what Cabrini-Green actually was to them." The LED lights will go down with 1230 N. Burling as it's demolished. They're attached to metal ammunition boxes painted neon orange for easy retrieval. Since the the building will be recycled on-site, says Tichy, it's important to keep the rubble as free of contaminants as possible. Sugar Ray Dinke performs "Cabrini Green Rap" Tuesday at the Promontory at the book-release party for Ben Austen's High-Risers: Cabrini-Green and the Fate of American Public Housing. They have their say in High Rise Stories, a new book of oral histories.